Yes we are a bit spoiled here when it comes to public holidays and this time they even announced great weather. But what to do on such a day? Taking the car was not really an option, since on such a day half of Munich is traveling south to enjoy the day in the mountains. We choose to take a bike ride and visit a small town some 22 miles northeast of Munich. We started early in the morning and planned to have lunch in a nice beer garden, once we would be there. To get to the river we have to take a short ride along one of the busiest streets in Munich which is part of a ring that goes around the Center of Munich. 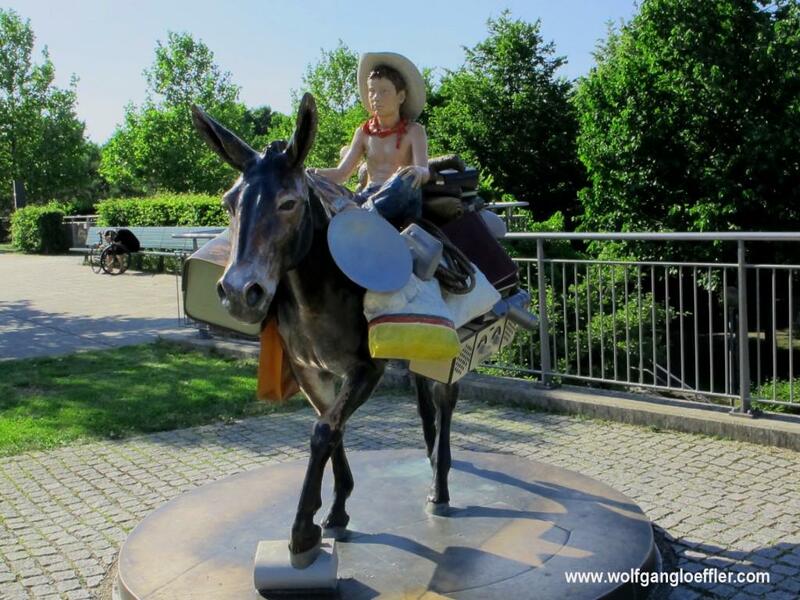 Parts of that ring have been tunneled and on the particular stretch where we had to pass, they have created in 2002 a new park (Petuelpark) which has won a lot of prices for being one of the best new urban gardens with lots of green and modern art. This where you will find the fellow below. We continue through the northern part of the Englische Garten, which is actually the biggest city park in the world, even bigger than New York’s Central Park. This part of the park is not so populated and it is easy to forget that you still are in the middle of a 1,5 million city. 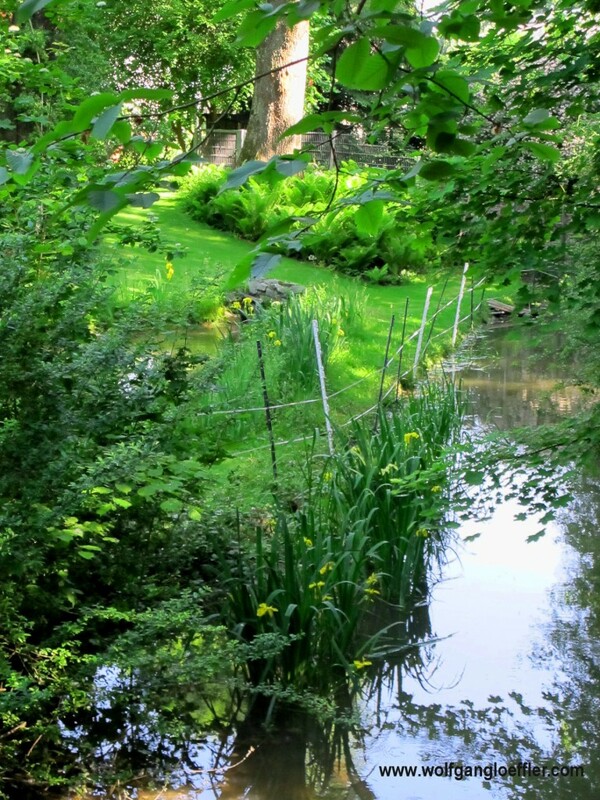 I just love this quiet and green place, crossed with small creeks. We have to cross a very nice neighborhood where there are a lot of small houses with lush gardens. How I would love to have one of those. Instead I live in a block from the early 1970’s. I probably shouldn’t be complaining, since we do have a rooftop terrace overlooking the BMW plant and the Olympic Stadion behind it. 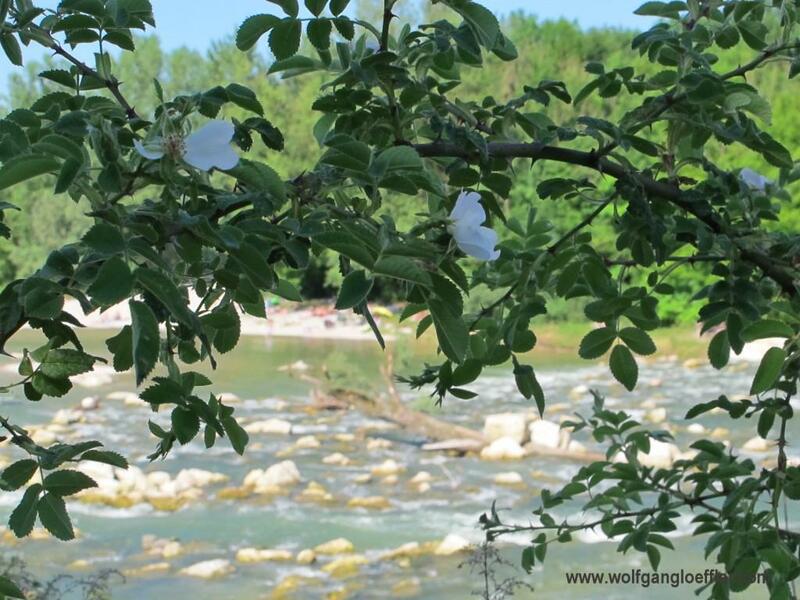 From the Englische Garten you’ll cross into the wetlands of the Isar without ever noticing it. Lush forest and singing birds bring you ever farther away from the city’s hustle. This is pure regeneration and I start to respire. We continue in a slow pace and enjoy the nature. I’m not a speeder, but usually I do ride the bike in a sportive way. Not today. The path is well prepared and there are no real mountains to climb. No need for a mountain bike here. There used to be quite some barrages along the river. A couple of years ago they started to restore the rivers original state and they just placed huge stones in the river instead of blocking it totally. With the time they will eventually become small islands. 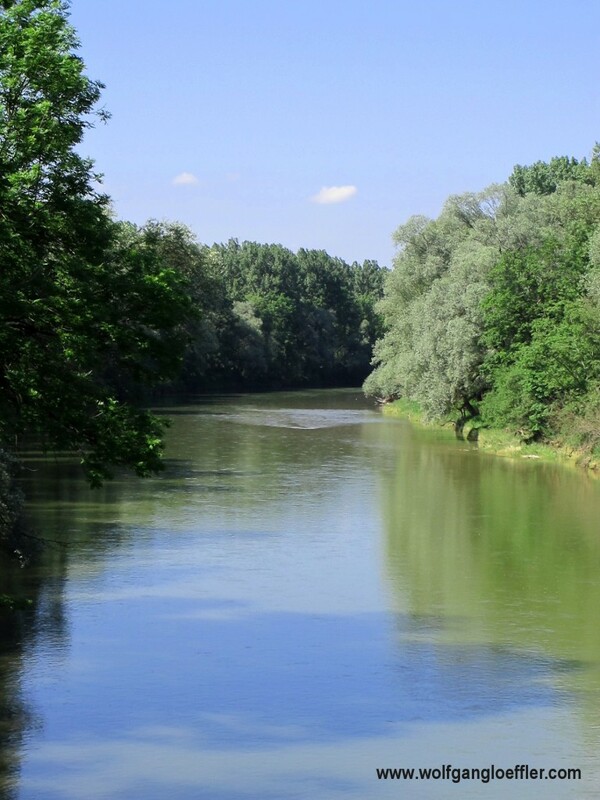 But you will also come over passages where the river flows slowly and almost looks like a lake. We see quite a few man in the river practicing fly fishing. in other areas we pass people in kayaks. It’s been a while since I last heard a cuckoo and so I am surprised to hear one today. I am not very superstitious, but there is this saying here in Germany that when you hear the first cuckoo in spring you’re supposed to shake your purse. This means that during the rest of the year you will always have enough money. Who doesn’t want that to happen? So I take out my purse and shake it. 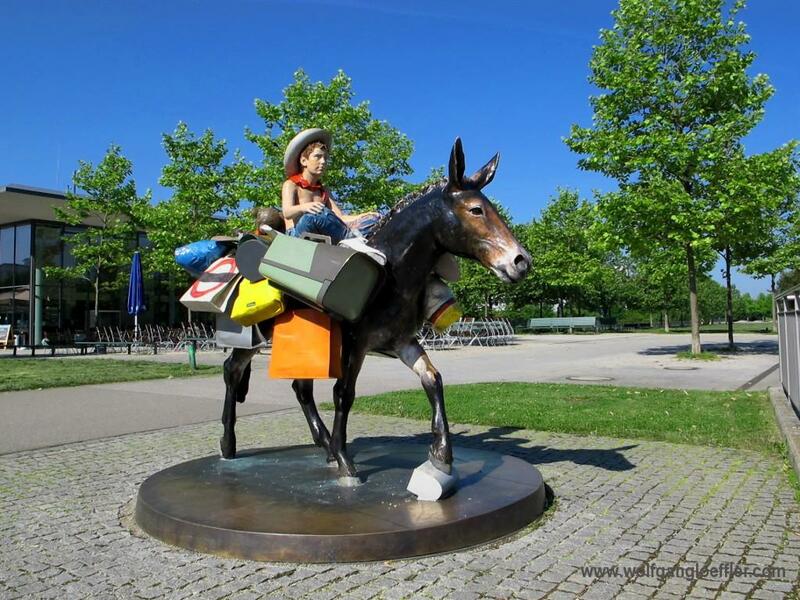 You never know…..
After a 2,5 hours ride we finally arrive in Freising. The historical town has a long history and used to be the most important town in the region. But then some guy decided to build a bridge over the river and founded a new city called Munich. The history of this town is entangled with the roman catholic church. Nothing less than 7 monasteries existed here. Today the city is known for its beer and dairy products. And it has its own university. Before we treat us to lunch in a beer garden we take a tour of the old town. Since this is a catholic holiday the city was decorated for the procession. But now at noon it is very quiet. Of course the people are at home for lunch. Which we are about have too now. There is just one more stop we want to make and that is climbing the hill, where the cathedral sits. And here we find some people. There is a street fair with food stands and real Bavarian brass music. All in a very festive atmosphere. 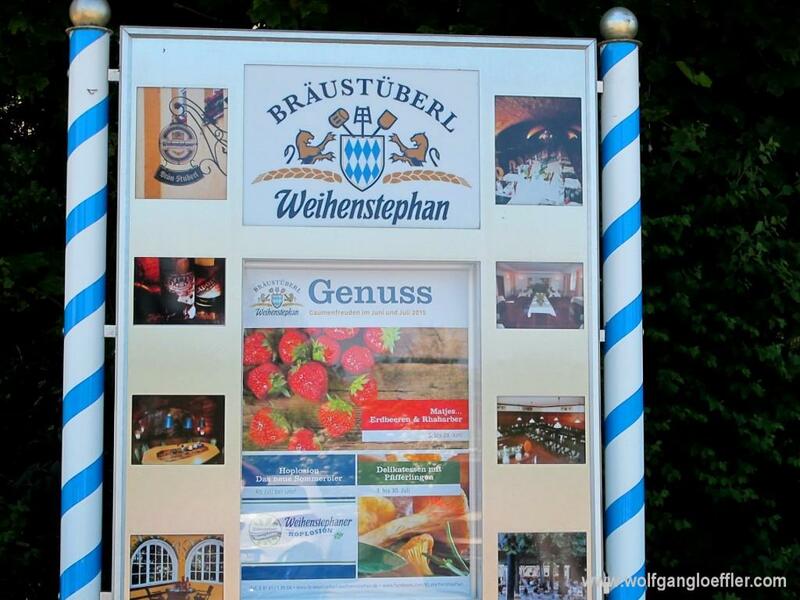 But our final destination Weihenstephan is still a few minutes ride away. To get there we have to cross the hole town and then climb another hill. The path leads across the modern Campus of the university. Usually campuses in Europe are tight and don’t have much of open space. But this one reminds me of the open and large campuses I have seen in the US. Must be very nice to stroll through a park on your way to your next class. 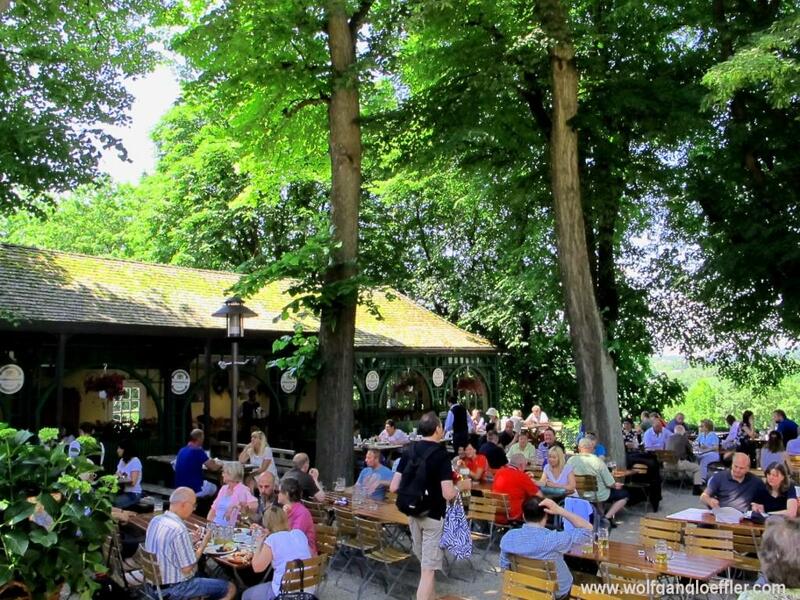 Finally we reach the beer garden of the “Bräustüberl” which is nice and cozily tucked under old lime trees. After this long ride and since we have another long ride to go back home I am not going to count the calories of my meal and settle for a roast pork knuckle with cabbage salad. Oh, how delicious this is. The meat has a very crispy crust from being on the grill for a long time. Along with the meal I am having a wheat beer and we enjoy a great view over the campus. Picture perfect! 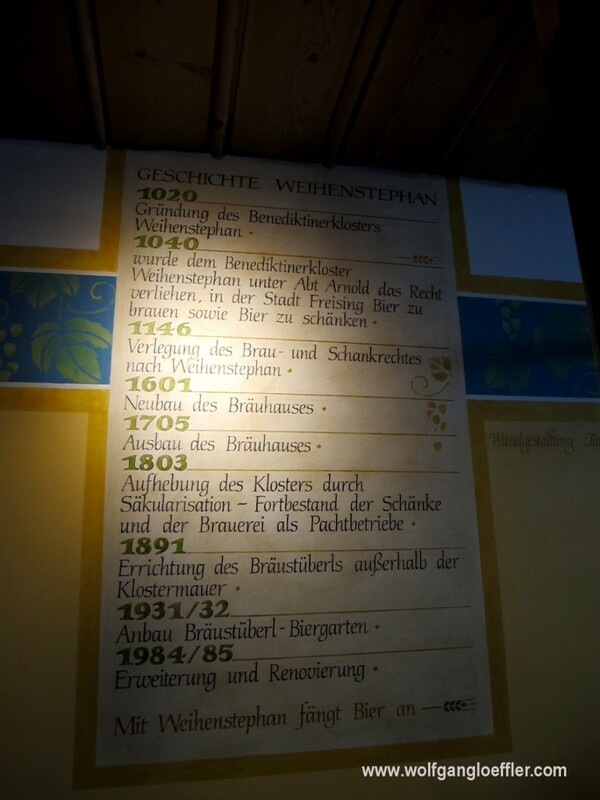 Weihenstephan claims to be the oldest brewery in the world. Let’s have a toast to the monks that have established beer brewing. On a day like today there is nothing better than a fresh beer from the tab and sitting in a garden. But these days I often opt for the non-alcoholic version, which is isotonic and low in calories. You could say it’s a healthy drink. Here a short history of this place (unfortunately only in German). 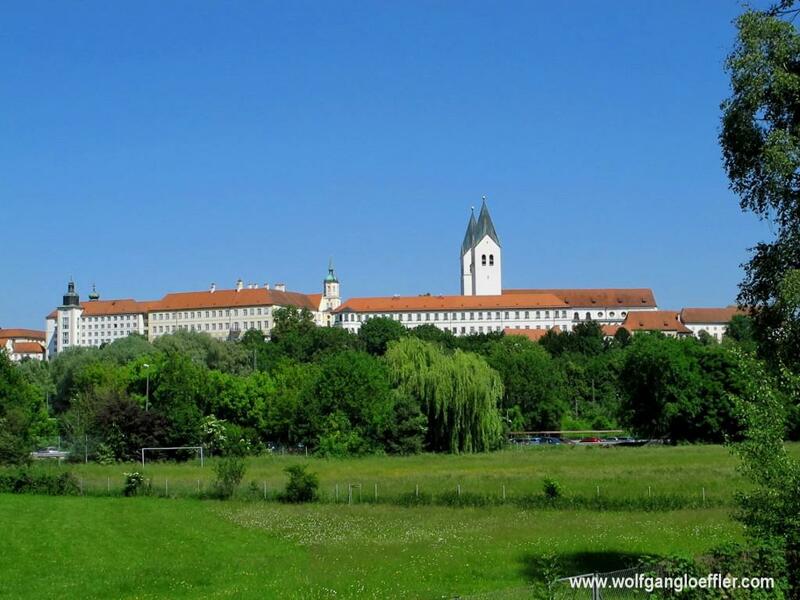 The monastery was founded in 1020 and 20 years later they did get the right to brew beer. Time’s up and we finally decide to hit the road. We could take a train to go back, but our pride wouldn’t permit this. On our way back we meet more people on the bike path then in the morning, but we still can ride at our own paste. Along the shores of the river we come across quite a few sunbathers and several smoking grills. Late in the afternoon we arrive back home a bit exhausted, but still very happy for having had such a great day. We most certainly will have to repeat this.